Lionel Messi scored a hat-trick in Barcelona's league game Sevilla, stretching his lead over his rivals in the race for European Golden Shoe. Barcelona returned back to the winning ways as they beat Sevilla 4-2 in their league game at the Ramon Sanchez-Pizjuan Stadium. Sevilla goes in front through Jesus Navas in the 22nd minute but their lead was short lived as Lionel Messi scored a spectacular goal to level the scoreline just four minutes after Navas's strike. Nevertheless, Gabriel Mercado restored Sevilla's lead in the 42nd minute, which was again nullified by the 31-year old in the second half. The Argentine gave the Blaugrana the lead for the first time during the game in the 85th minute, with Luis Suarez also ended his goal drought during the match by scoring Barca's fourth goal in the second half stoppage time. The Catalonian club moved 10 points clear of Atletico Madrid in the La Liga table with this victory and are now the favourites to lift the trophy for the second consecutive year, with just 13 games left to play this season. 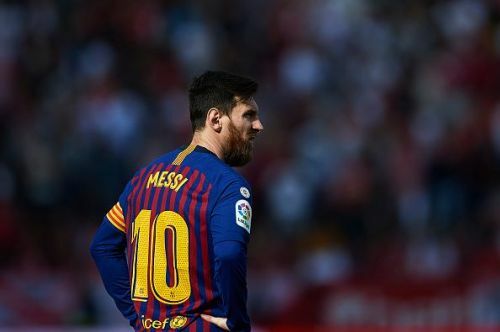 With a brilliant hat-trick against Sevilla, Lionel Messi took his La Liga goal tally to 25 goals and is now three and six goals ahead of Kylian Mbappe(22 goals) and Cristiano Ronaldo(19 goals) respectively, in the race for the European Golden Shoe. AC Milan's striker Krzysztof Piatek currently occupied the fourth spot with 18 goals, with Mohamed Salah, Sergio Aguero and Edinson Cavani also not too far behind with 17 league goals respectively. The Argentine forward won the accolade for record-five times and he is also the only player to score 50 goals in a single league season(2011-12 season). His hat-trick against Sevilla marks as Messi's 50th career hattrick and he is now just one behind Cristiano Ronaldo on the list of most career hat-tricks scored. Barcelona will play Real Madrid for the second leg of the semi-finals of the Copa del Rey next before facing them again in the league on March 3.